The Baloch population, in both Pakistan and Iran, endures difficulties in raising international awareness of their situation of poverty, violence and discrimination. A few weeks ago, a high number of executions took place in the village of Roushanabad, in Iran, after the entire male population of the village was arrested accused of drug-related charges. 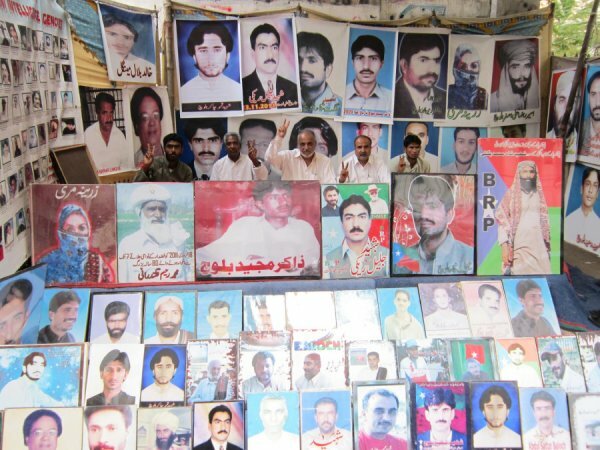 In Pakistan, where “bodies are found days later, with visible signs of torture or mutilation”, enforced disappearance ranks as one of the most common threats. These practices have come to be called as the ‘Kill and Dump’ Policy of Pakistan. Photo courtesy of https://baluchsarmachar.wordpress.com. Below is an article published by The World Post. Last month a shocking story gained little traction in the mainstream press, despite its horrific implications and brutal reality. A report from Iran emerged which detailed how every man from a village in the province of Sistan Balochistan had been executed. The Baloch, an ethnic minority in both Pakistan and Iran, continue to face systematic repression in both of these countries, yet remain largely ignored in both the East and the West. Simply having their voices heard remains a major struggle for this stateless population faced with poverty, violence and discrimination. The Baloch are a distinct ethnic group who reside in the lands between southwestern Pakistan, southeastern Iran and a very small section of southwestern Afghanistan. Yet many fear that they have become invisible in their plight. Their struggle is reduced to a footnote in a region locked in turmoil. Their stories are overshadowed by the refugee crisis, bloody civil wars, and an attempt to silence them in the countries they now reside. The executions in question took place in the village of Roushanabad, in southeastern Tehran, with the entire male population being arrested and sentenced to death on drug charges. Incidentally, Sistan Balochistan is Iran’s poorest province, and home to the ethnic Baloch who remain disenfranchised in Iran both as an ethnic minority and as Sunni Muslims. The majority of those executed in the province faced drug charges, and often received convictions without access to counsel or proper due process. Iran’s use of the death penalty in such cases is illegal under international law, yet the practice not only continues, but is actually funded by the United Nations and European countries. The situation of the Baloch in Pakistan is much the same. Ethnic Baloch remain second-class citizens within the country. Over the last decade thousands of ethnic Baloch have disappeared in the Western Pakistani province of Balochistan allegedly abducted by state security forces. Often times bodies are found days later, with visible signs of torture or mutilation, in what has come to be called the Kill and Dump Policy of Pakistan. In other instances a body is never recovered, and the state denies any responsibility. Over the last 6 months, Pakistan has conducted a series of low profile raids in Balochistan, often times targeting activists under the pretext of fighting “terrorists” and “miscreants”. Underlying these repressive policies is Pakistan’s construction of a major port in Balochistan, with the cooperation of the Chinese. This strategic port has not only resulted in increased tension between the Baloch and the Pakistani government, but has raised allegations of ethnic cleansing by the authorities against the local population. The invisible war in Balochistan is a case study on the failures of human rights and international outcry in a world saturated with injustice. There are no flotillas going to Balochistan, nor is their struggle a cause célèbre for Western intellectuals or activists. The Baloch are repressed at home, ignored abroad, and treated as an inconvenient relic from the past that won’t go away. It appears that those who remain stateless and are of little use for particular political agenda are fated to remain marginalized and invisible in the modern world.